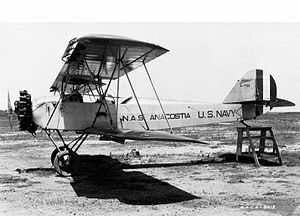 The Consolidated Model 2 was a PT-1 biplane trainer diverted to the United States Navy for a trainer competition in 1925. It beat out 14 other designs, and was ordered into production as the NY-1. The NY-1 was essentially a PT-1 with provisions for the wheeled landing gear to be replaced by a single large float under the fuselage and two stabilising floats under the tips of the lower wing. A larger vertical tail was added to counter the effect of the floats. The NY-2 had a longer span wing fitted to overcome the high wing-loading issue of the seaplane version. Tested with complete success during October 1926, the Navy ordered 181 with the uprated R-790-8 Wright Whirlwind J-5 engine of 220 hp (164 kW). The NY-3 aircraft were similar to the NY-2 but had 240 hp (179 kW) Wright R-760-94 engines. The NY-1's first flight was November 1925, with deliveries starting May 1926. The NY-2's first flight was October 1926. The Navy had 108 in active use in 1929, with 35 more assigned to reserve squadrons. The NY-3 was delivered in 1929. The NY series was being phased out in the mid 1930s, with 15 in service in 1937, and one in service in 1939. Data from "The Complete Encyclopedia of World Aircraft" Editors: Paul Eden & Soph Moeng, 2002, ISBN 0-7607-3432-1), page 478.